Back to Mozambique 20 years later: is optimism overblown? During my first field trip to Mozambique in May and June this year, it was clear that the country has been through quite some change since I left as a kid nearly 20 years ago. Back then in the early 90s, my parents were there working in development cooperation and aid projects – at a time when the notion of expats acting as ‘capacity builders’ was (even more ) widespread across Africa. Located on the Southeastern corner of the African continent, Mozambique has since seen the end of a more than a decade long civil war (1977-1992), experienced a UN peacekeeping force on the ground (1992-1994), and, by the early 2000s, was deemed an African ‘success story’ by organizations such as the UN and the World Bank. Corroborating these favorable assessments, the country has held elections on a regular basis, the economy has grown, and landmines have been totally cleared as of 2015. More recently, Mozambique is amid what many call the ‘new-scramble’ for Africa as new mineral (and profit)hungry global players, especially China, but also other emerging economies such as Brazil and India, have ventured into the continent in search of business opportunities and diplomatic influence. And this new geopolitical trend, and how it plays out in Mozambique, is the theme of my own PhD research here at the University of Groningen. Whether the works of karma or not, my PhD has brought me back to Mozambique several years later. From whatever flash of memory, my parents’ own accounts and pictures I could recall, Maputo – where we lived – was a decaying capital, deprived not only from basic urban infrastructure, but also scarce of several goods, from pharmaceutical products to alimentary items. While Maputo was relatively stable and safe during the civil war, travels to the Mozambican countryside could only be done in military convoys. In our privileged condition as expats, I remember we would regularly take the 3-hour drive – at the time one of the few safe routes – to Nelspruit in South Africa to buy supplies or to simply visit the doctor. The Polana Hotel – located in a stylish colonial building – was pretty much the only meeting, lodging and dinning point for affluent foreigners on trips to Mozambique. When I landed at Maputo International Airport in May 2018, I was confronted with a relatively new, spacious and comfortable terminal building –built by the Chinese. It was also visible that the rest of the Mozambican capital was a different city . Nowadays, as the Al Jazeera has described: “it’s a brasher, noisier, with more cars, lots of construction, and many new businesses”. Supermarket chains from Dutch SPAR, to Indian Lulu Hypermarket , to South African Shoprite are all to be found in Maputo and other major Mozambican cities. Besides the traditional Hotel Polana (now newly renovated by… the Chinese! ), other hotel chains such as Radisson and enormous Chinese-owned Glória Hotel – located along Maputo’s upscale coastal Marginal Avenue – are there to welcome wealthy visitors and to host international conferences (ironically, many of which discussing Mozambique’s development issues). When quickly glancing through Maputo’s skyline upon landing, a 3-kilometer bridge under construction connecting Maputo to Katembe – a district across the Maputo Bay – immediately catches the eye. Financed and constructed by the Chinese, it illustrates better than anything else China’s vigorous and resolute presence in the country. Up north, the provinces of Cabo Delgado and Tete are perhaps the best examples of Mozambique’s recent transformation. New discoveries of large natural gas reserves off the coast of Cabo Delgado coupled with coal mining in Tete have led to much optimism : an economic and development breakthrough, as suggested by my interlocutors at the Mozambican Confederation of Economic Associations. While in the early 90s, many Mozambican refugees have fled to neighboring Malawi and Zimbabwe, I have met many Malawians and Zimbabweans that now do the reverse in search of better economic prospects in what they consider the mining and gas Eldorado of Southern Africa. As a result, the prospect of tremendous gain from the extractable resources has attracted external capital and foreign companies alike. And triggered a construction boom in infrastructure – much of it of course designed and built to support the extractive industries. A quick look on a detailed map of Mozambique reveals how much of the railway infrastructure is geared towards the export of minerals. Labelled as ‘corridors’, these infrastructures usually link a mineral-rich hinterland to a port on the Indian Ocean, with little to no transversal integration between the corridors. The strong presence of China – and of other emerging economies – in Mozambique, but also in Africa more broadly, revolves largely around this infrastructure boom. There are three reasons for this. First, the 2008 financial crisis coupled with the re-shifting of Western assistance towards governance and social sector spending has created a void that came to be filled by other actors, especially in the realm of capital-intensive and risky undertakings such as infrastructure projects . Second, a favorable and converging scenario consisted of: the high-demand for natural resources in the emerging economies, on the one hand; and on the other, especially in post-conflict African states, the need to build and rehabilitate their infrastructures. And third, the fact that relations between the emerging economies and African countries are often promoted as carrying none of the neocolonial ties and hypocrisies associated to the West. Illustrating this last point, China’s ambassador to Mozambique declared to a local business magazine: “China and the African countries have had similar experiences of being economically controlled and of being treated unfairly [by the West]”. In Mozambique, like in other parts of Africa, these new players – China most prominently – are similarly criticized on three fronts: (i) for unfairly exchanging infrastructure projects for generous concession deals on natural resources, (ii) for the poor quality of works and the proliferation of ‘white elephants’, and (iii) for keeping a blind eye on human rights and governance issues. Yet, the greater importance of alternative players in Mozambique’s political economy, while not near to end the country’s aid dependency, has contributed towards a diversification of Mozambican foreign policy options away from over-reliance on the West. As recalled by a researcher, more diversity has empowered the country in its foreign and economic relations: through greater choice, there is now more bargaining power to negotiate agreements on better terms. An economic and development breakthrough? While my fieldwork impressions suggest at a first glance that a ‘new’ , ‘better’ and ‘empowered’ Mozambique has emerged, numerous conversations I had with chopela (tuk-tuk) drivers, shop owners, students and activists underscored that not everything was going right: Mozambique remains one of the poorest countries in the world, they would often tell me. Cautious about Mozambique’s fairy tale narratives, these interlocutors would often point at a range of intertwining bottlenecks during the last years, especially: the highly concentrated (and corrupt) political system, the unrealistic assessments and broken promises connected to the country’s resource windfall, and the country’s deteriorating security situation. 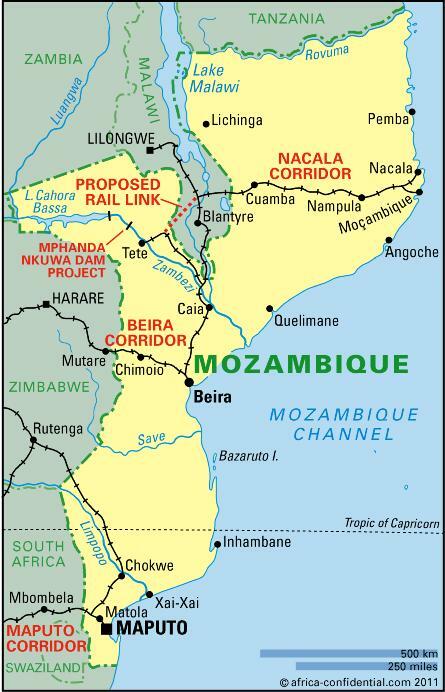 To start, Mozambique has been ruled by a single party since its independence from Portugal in 1975. The FRELIMO ‘party-state’, how it is often described by scholars, is dominant at all levels of power: it controls the presidency, local governance apparatuses, public institutions, investments, aid flows, and has parliamentary majority. The overall weakness and erosion of checks and balances allows FRELIMO to govern almost unchallenged and, as a result, corruption emerges as a defining feature of governance and of the businesses environment in Mozambique. The advance of more players coupled with more financing opportunities and investments have similarly led to debt scandals, and have set the stage for more and ‘improved’ kickback and embezzlement schemes. Corruption is, of course, prevalent across all political systems and, to make justice, ameliorating efforts have been put in place in Mozambique. Yet, when travelling through the country, the consequences of corruption were visible to me at all levels of society: through the poor quality of most public services, when passing through security and customs at an airport, or when requesting access to fieldwork sites. The prospect of enormous gain from the extractive projects has also frustrated many. From a macro-economic perspective, the possibility of resource and revenue mismanagement, the downfall of commodity prices, and the often prohibitive technological and financing requirements mean that extraction has not yet taken off in several places. For the average Mozambicans, the export of commodities has led to limited positive impact in poverty levels and job creation – most of which of a temporary nature. And not least, the maximization of corporate transfer of surplus abroad through fiscal benefits, the absence of capital control mechanisms, and elite capture of the little surplus that remains in the country has contributed to reinforce, rather than to challenge, Mozambique’s economic and social vulnerability. An already far too common story when it comes to extractive dynamics across the Global South. And finally, an ongoing fear relates to the possibility of the return of a full-blown armed conflict between the government and RENAMO, formerly the rebel party during the civil war and nowadays a major opposition force. In light of Mozambique’s concentration of power and ‘winner-takes-all’ politics, there has been an outbreak of violence and a series of clashes between RENAMO and government forces as of 2013. Promises to decentralize and to increase RENAMO’s access to the ‘spoils of power’ has led to a declaration of ceasefire in the end of 2016. Although the ceasefire has held until nowadays, imminent instability is just ‘around the corner’. And to make things worse, in the past few months emerging Islamist militant groups – with alleged links to Somali Al-Shabaab – raided several villages in gas-rich northern Mozambique, causing panic among residents and apprehension for the newly established energy companies. Mozambique’s worsening security situation is especially tangible during times of recession and authoritarianism – as political standoffs and grievances tend to dangerously break into violence . While I have met a different country, a Mozambique that has changed and accomplished positive things in recent years , travelling across the country and talking to Mozambicans have contributed to temper my initial optimism. Even at times when things are seemingly going smoothly on the surface, instability, insecurity and vulnerability may yet flare up in a country in which the rewards of development have been unequally distributed and have failed to resonate with the needs of the majority of its people. Yet, as a hopeful and optimistic Mozambican mining worker told me: “We are aware that there are a set of variables that would require decades till we have a concrete transformation, but I hope the conditions for my children in this country will be better”. Eric Cezne is a PhD candidate at the International Relations & International Organization department of the University of Groningen. In his PhD, he looks at modalities of South–South cooperation and investments through large-scale infrastructure arrangements in and around extractive and transport settings in northern Mozambique. Parallel to his PhD research, Eric coordinates the work package 'Brazil in Mozambique' of the ERC-funded 'Infrastructure Globalities: Rethinking the Political Geographies of Economic Hubs from the Global South' (INFRAGLOB), held by Dr. Jana Hönke at the University of Groningen.